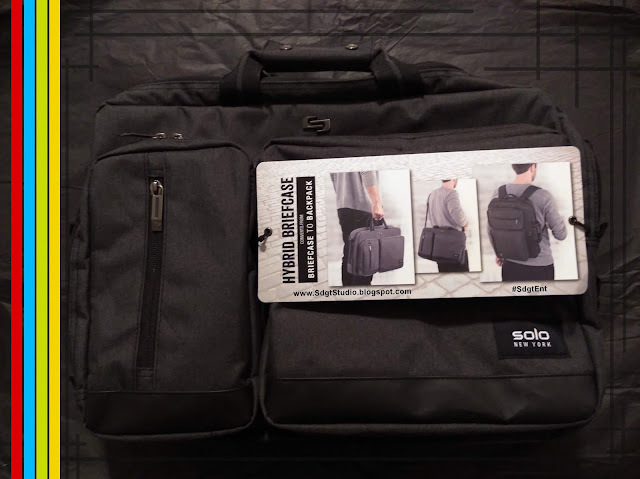 Super Duper Gamer Team Entertainment: SOLO New York: Hybrid Briefcase... Reviewed! This review has businessmen and women in mind, but... before jumping into it... let's unbox it! Happy 10th Anniversary... SOLO! I love unboxings, so when this package arrived... I was like "ALRIGHT!". It arrived just in time for my trip. This review... answers the question I've been asked multiple times by busy professionals. You can have a briefcase and a bookbag... you don't have to tuck a big drawstringer... in your bag to deploy when needed. I present to you, SOLO's... 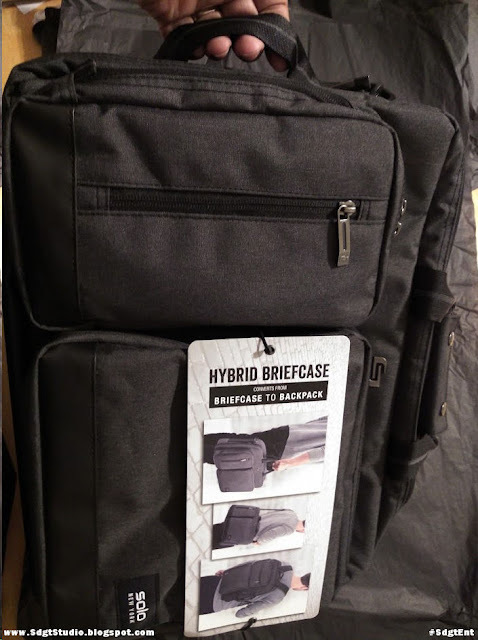 Hybrid Briefcase Backpack... which allows you to switch between briefcase and backpack in as quick as 5 seconds or so. 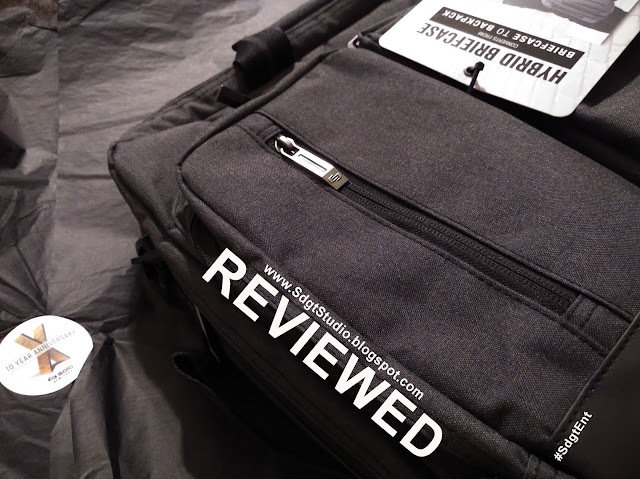 If you travel and you need a briefcase that gives you the benefits of a bookbag, this is the type to consider. Sometimes you don't mind carrying your briefcase when it's just the briefcase, but when you have to grab luggage to head to and from the airport, work, or school campus... this hybrid is perfect. When you have to carry a briefcase and hustle over to a convention hall (or where ever you go), in addition to food and a beverage... that extra hand can spare you some unnecessary stress. Shoulder straps generally come with briefcases (excluding the hard-shelled ones I know of), this one is no different even if my experience using shoulder straps isn't the best. Using shoulder straps usually leaves me with this unpleasant feeling on the side of my neck from the weight pressing against it. That's not a warm fuzzy feeling... and I hate adjusting it only for it to slide right back against my neck (like "It's nice to see you again"). This may or may not just be a personal problem I've had... but that's why I don't really use them. 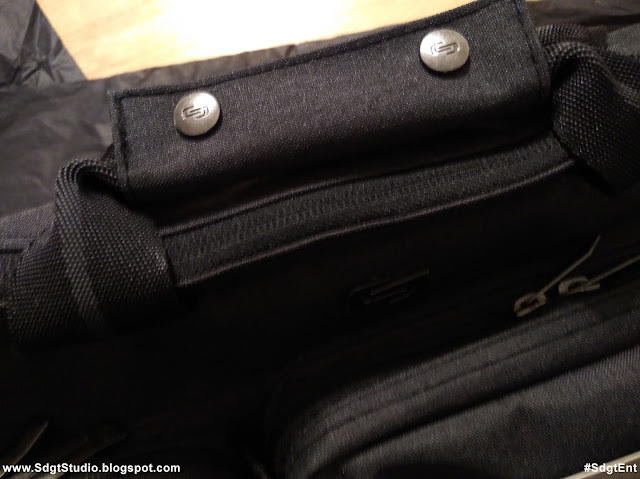 Here are images of the shoulder strap for this hybrid briefcase. The strap isn't bad, it has padding... but shoulder straps, in general, are not for my thing. I didn't carry it for a long period of time using the shoulder strap... but there's nothing specific about it that would prevent it from delivering the same experience as others. To each your own preference, it comes in handy... but the other carrying options are better for me. It's cool though... you get 3 options in this bag, so keep calm and... "carry on" literally! 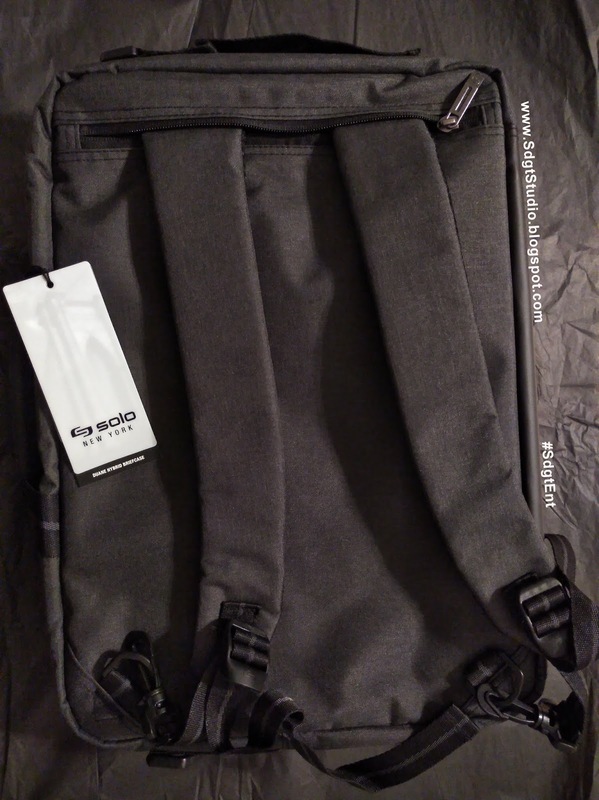 The backpack straps have the same mesh padding and look on the underbelly. As seen in this image, I'm holding the bag and comfort wise... it's been good. I haven't carried the bag for a long period of time as a briefcase, but... considering the times where I may have to... I'd prefer more padding. If there were a revision, I'd like to see a gel insert added or something matching the shoulder strap padding... and since it isn't visible, it won't be noticed. One thing the handle has going for it though is the grey polyester material covering it, its easier on the hands. This material is the same as the bag... except for the bottom (i'll get to that in a bit). It's a nice clean professional look, even when its worn as a book bag... it looks good with casual or formal businesswear. They didn't overdo it in the looks department, but the small touches such as the magnetic snaps, and the black material at the bottom of the briefcase + the lower area of the pockets are just right. Here's a closer look. 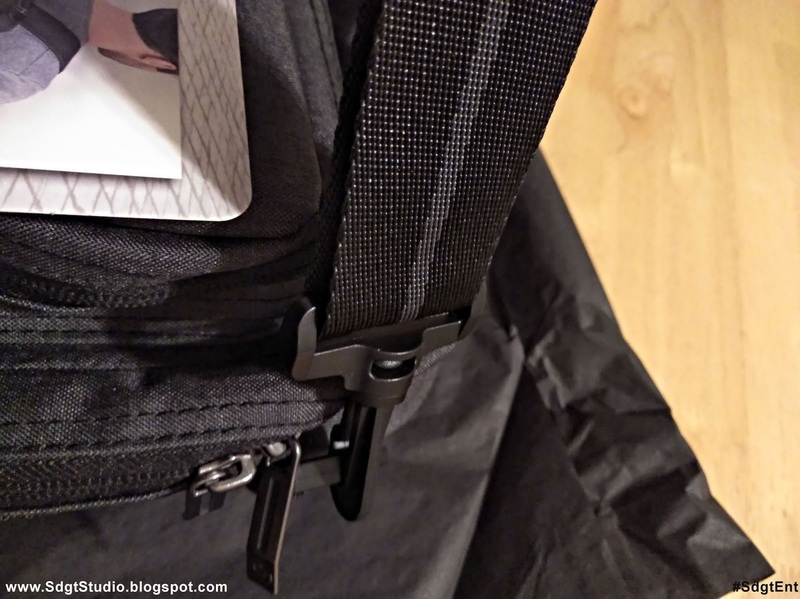 I know the more professional look is to carry it by the handle or the shoulder strap... but when its time to hike it, pull out those straps so that you can benefit from the backpack feature (its better on the back when there is more weight inside). It doesn't look weird and cheesy either... the straps are tucked away in the back compartment of the briefcase until you need them. Once you connect the straps... it wears like any other bookbag and it feels normal. What I mean by "normal" is that it isn't just a makeshift backpack feature that feels weird on your back. As you see in the image below, you can't even tell that its a briefcase here. Since it is a briefcase though, one thing I do advise is... when you're going from briefcase to backpack, shift the zipper pulls up. Don't leave the zipper pulls to the side or aimed toward the ground like seen in this image, pull them around until they face north. They didn't open on me... I'll admit that, but do you really want to take the chance of having them unzip and your items fall out? Didn't happen, but better safe than sorry. By the way, the zipper pulls are nice... and I appreciate the fact that they seem to be maintained across SOLO bags. This specific product would benefit from zipper pulls that lock together in some sort of way... based on the fact that it can be used in two ways, then no worries about shifting the zipper pulls. I was able to place a laptop in this briefcase + cord, camera, phone, notebook, some in-ear headphones, and... a game controller (I didn't attempt to insert large gaming headphones, but DJ style should fit comfortably). You have room for other things like business cards and pens, and I was even tempted to try and stick a digital drawing tablet inside, but I didn't aim to over pack this thing. I was trying to pack it according to scenarios where I might take a briefcase, like to an event or... whatever. I included the game controller because... some of us have gaming laptops, and sometimes that's part of the agenda once back at the hotel or wherever downtime will commence. Break time for some conventions can be long and... if you've already networked... game on! I can't forget about delayed or long flights, train rides, etc. The hybrid briefcase is part of the downtown collection, inspired by the "spirit" of lower Manhattan (NY). 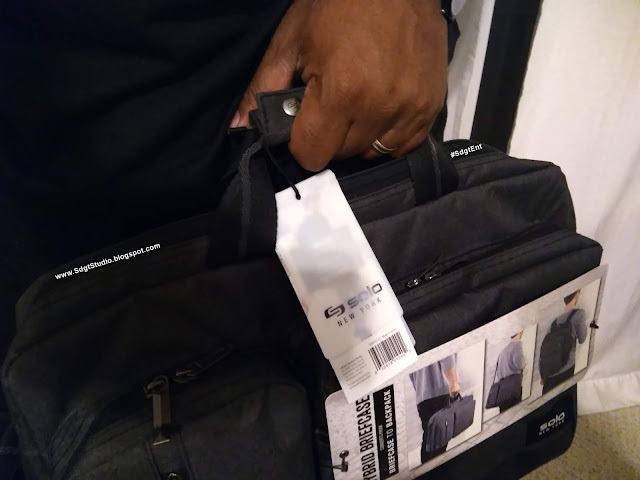 The briefcase is able to hold up to 15.6" laptop's in its padded laptop compartment, an additional pocket for a tablet + two front access pockets. The bigger front pocket has the pen and card holders. 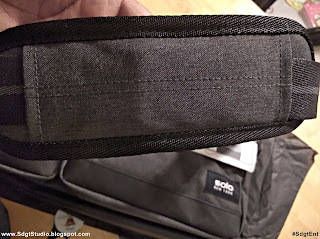 The smaller pocket has a zippable compartment in front for various things like cell phones... as seen in the video above (pretty spacious). I actually put a game controller in that compartment. When it comes to the price of this hybrid briefcase... no need to brace yourself, it's only $49.99. This doesn't feel like it's over or under-priced... they nailed this one, even if it would've been super safe at $59.99 based on its versatility. 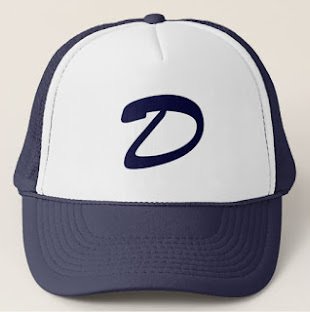 It comes in two colors, grey and black... but I like the grey just a bit more. When it comes to durability... it doesn't feel like this bag would just fall apart, but... at the same time, I wouldn't overfill it either. It's not one of those bags that I see being overfilled anyway (without looking deformed), but if you want to pack it up... go with what works for the body of the bag. Use the right size laptops, forget trying to stuff a game console in it... unless its a Nintendo Switch and leave it at that. Take care of it... and it should be good for the long haul, I even recommend having multiple bags for different occasions... because adventures vary. Did I forget to mention that this briefcase has a 5 year (limited) warranty? 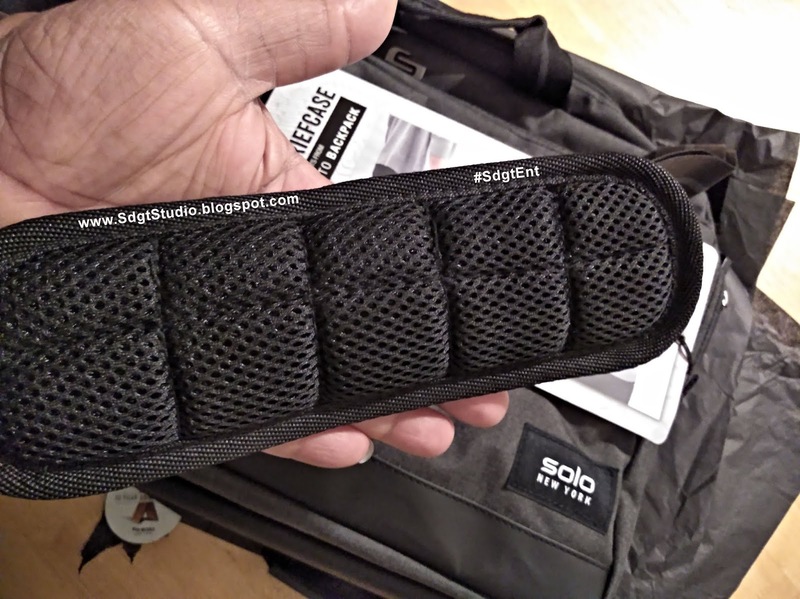 Overall, I think Solo's Hybrid Briefcase Backpack is a very nice useful bag. 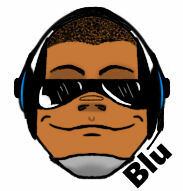 It feels comfortable in my hand and on my back, and if you want to use the shoulder strap... you have that option too. No only does it allow you to free up your hands, but it looks good with various dress codes... and the price is right. Two thumbs up. This product was provided for review by Solo New York!